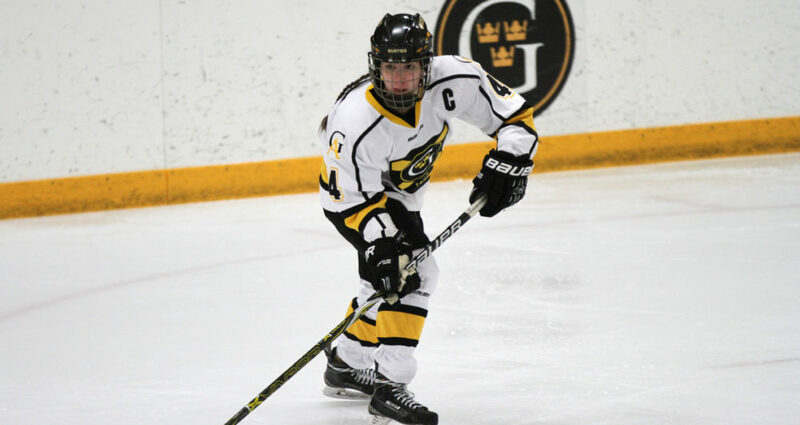 ST. PETER, Minn. – The Gustavus women’s hockey team lost to Hamline 4-1 Saturday afternoon in the MIAC playoff championship game at Don Roberts Ice Rink. The loss snaps a 12-game unbeaten streak as the Gusties move to 20-3-4 overall. Hamline receives an automatic qualifier to the NCAA Championships, which begins next Saturday, while Gustavus will wait until Monday to see if it receives an at-large bid. The Pipers started quick early in the first period, controlling their offensive zone for a majority of the opening minutes and were rewarded with a goal at the 5:42 mark. Exactly midway through the first period, Hamline took a 2-0 lead on another even-strength goal. The Gusties found themselves on the power play late in the opening frame and took advantage of the opportunity as Diana Draayer (Sr., Deephaven, Minn.) scored her 18th goal of the season on a perfect pass from Kaitlyn Klein (Sr., Plymouth, Minn.) with 38 seconds remaining. The second period was on pace for a scoreless 20-minute section before the Pipers scored on a breakaway with 33 seconds left in the middle frame, taking a 3-1 advantage after 40 minutes of play. And with time dwindling down in the third period, Gustavus pulled goalie Amanda DiNella (Jr., Oakbrook Terrace, Ill.) with 2:26 left in the game and the Pipers found the empty net 32 seconds later to secure the victory. The Gusties out-shot the Pipers 36-24 and killed of both Hamline power plays, but went just 1-for-4 on the skater advantage. DiNella made 20 saves in the loss, while her counterpart McKenna Hulslander made 35 saves.